LAN Talk messenger 3.6.5584 - Download Win Apps. LanTalk LAN messenger is better alternative to Microsoft WinPopUp. In comparison to LAN Talk messenger 2. 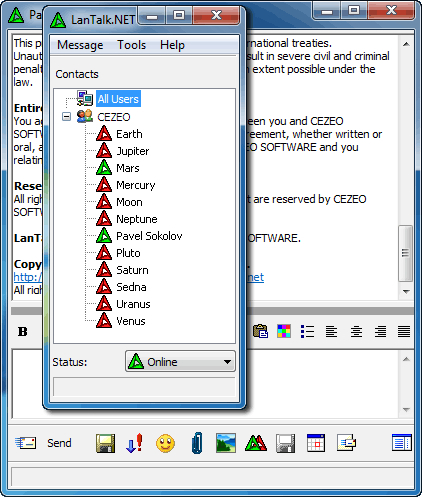 52 is designed for small and medium enterprise to send instant message by using Office's Local Area Network. Secure, simple and stable!Key features:1. Send instant message and offline message;2. Send file, folder;3. A corporate lan instant messaging solution. Specially designed for use inside corporate networks (intranet). No internet connection required. Strong encryption makes communication and data transfer more secure!.